A.P.E.X. Events presents the founder of Women for Women International, best-selling author and humanitarian, Zainab Salbi. 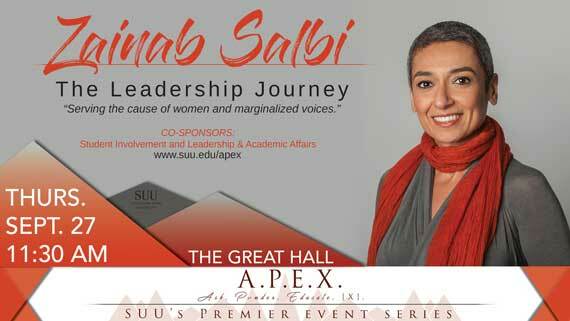 Named as one of the “25 Women Changing the World” by People Magazine and one of the “100 Leading Global Thinkers” by Foreign Policy Magazine, Salbi is dedicated to serving the cause of women and marginalized voices. Join her Thursday, September 27 at 11:30 a.m. in the Gilbert Great Hall at Southern Utah University. This event is free and open to the public. At the age of 19, after a three-month arranged marriage in the U.S., Salbi left her husband with only $400 in her pocket and completely alone in a land far from home. This was the moment she decided not to say “I have nothing,” but to say “This is my chance to help women all around the globe.” Her decision led her down a path of self-discovery and service, creating her own non-profit and writing best-selling books. At the age of 23, Salbi founded Women for Women International, a grassroots humanitarian and development organization dedicated to serving women survivors of wars by offering support, tools, and access to life-changing skills to move from crisis and poverty to stability and economic self-sufficiency. Through Women for Women Intl., she has influenced the lives of over 450,000 women across the globe. As an author, her works include the national bestseller Between Two Worlds: Escape from Tyranny: Growing Up in the Shadow of Saddam and the forthcoming Freedom Is An Inside Job: Owning Our Darkness and Our Light to Heal Ourselves and the World. Vogue magazine described the book as "...a torrent of vividly recalled memories [that] reads with the sort of artless verve that can come only from one who's been unshackled from a lifetime of repression."